Why use a Mobile SDK? Omni-channel engagement re-prioritizes mobile devices, as they are the core of an interconnected digital experience. Customers are replacing desktop browsing with messaging, chatbots, and video calls – all from their mobile device. That’s why we design all of our features with a “mobile first” approach, optimizing for mobile before adding other touchpoints. 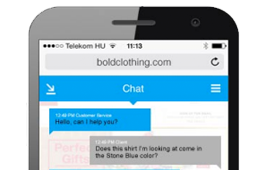 Bold360’s mobile SDK enables businesses to embed chat in their native iOS and Android applications, creating a seamless mobile engagement experience for their customers. The elegantly designed in-app chat interface can be fully customized and easily deployed with minimal code. To read more about these features, download the mobile SDK datasheet.